In this special edition of The Full Nerd, Gordon sits down with Jim Anderson from AMD to go over all the 2nd Gen Threadripper details including pricing, clock speeds, and availability! In this special episode of The Full Nerd, AMD senior VP of computing Jim Anderson joins Gordon Mah Ung to dig into the details and backstory of the newly launched 2nd-gen Threadripper CPUs, spearheaded by the monstrous 32-core, 64-thread Threadripper 2990WX ($1,800 on Amazon). And I think that's a pretty good start to an interview. 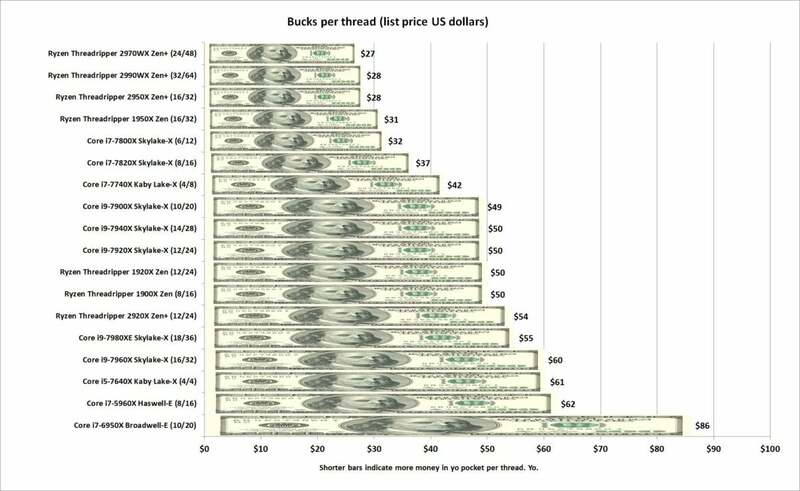 The cost per-thread of AMD’s Threadripper and Intel’s Extreme Edition chips. You can read our review of the 32-core Threadripper 2990WX and details about the three other 2nd-gen Threadripper processors coming later if you want simple speeds and feeds. But stay tuned if you want to dive deep into AMD’s approach when designing these monster chips, blending maximum performance with affordable prices. Did you know Threadripper’s genesis was as a skunkworks-style project by a small group of enthusiasts within AMD, business plans be damned? And yes—a 32-core Threadripper chip was planned from the start. Anderson also explains why maintaining compatibility with existing X399 motherboards was so important for AMD, and how the software and gaming ecosystem is evolving to leverage the new wave of mega-core chips after being stuck on four cores for a decade. Where do we go from here? While we had Anderson trapped in our podcasting room, Gordon pitched Anderson on a nostalgia-tinged “Athlon special edition” in the vein of the Intel Core i7-8086K. Why not, right? Tune in, and don’t forget to read our review of the 32-core Threadripper 2990WX ($1,800 on Amazon) while you’re watching. Editor's note: This article originally published on August 6, 2018 when AMD announced speeds, feeds, and prices of the 2nd-gen Threadripper CPUs. We updated it on August 13 to include links to our review of the Threadripper 2990WX.